Michel Bizot is a station on line 8 of the Paris Métro, named after the Avenue du Général Michel Bizot. The station opened on 5 May 1931 with the extension of the line from Richelieu - Drouot to Porte de Charenton. The Avenue du Général Michel Bizot is named after a general (1795-1855) killed in the Siege of Sevastopol during the Crimean War. 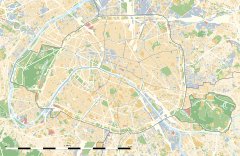 Nearby is the Promenade Plantée—a 4.5 km long elevated garden along the abandoned railway which led to the former Gare de La Bastille railway station.